The entrance to Union Station is one of the areas that underwent a complete renovation. Outside of a stint in the military, Jeremiah Micka has worked at Union Station in Northampton since age 13. He knows every nook and cranny in the building, but will never forget the awe he felt the first time he entered the doors of the main area, which was built in 1896. “I had never been in a room with 20-foot ceilings and such impressive lighting. But I always thought it could be something grander than a restaurant. It deserved to be a ballroom,” he said, adding that Presidents Calvin Coolidge, Herbert Hoover, William McKinley, and Theodore Roosevelt made appearances there. It took years for Micka to realize his vision, but today it has become a reality. Union Station has undergone a $1 million renovation, which preserved the historic interior, but revamped areas that needed improvement. Micka began the work in November 2013 after purchasing the building, where he had been employed as a line cook, server, bartender, and bar manager. He contracted some jobs, but much of it was a labor of love, and he put in countless hours of painstaking effort to get things exactly the way he dreamed they should be. Renovations included a new roof on the building, gutting the bathrooms and replacing them with modern fixtures, and installing new carpeting, a dance floor, and a tile floor in the hallway. The entranceway also received attention, and charm and utility were added with Goshen stone steps, brick pavers, stone walls, new plantings, and a curved handicapped ramp. When Micka took the building over, the well-known Tunnel Bar in the basement of the building, and the Deck, located outside of the station, were doing well. But he knew the area that had been occupied by Spaghetti Freddy’s for years was an architectural gem, and he transformed the former restaurant area by focusing on its historic attributes. 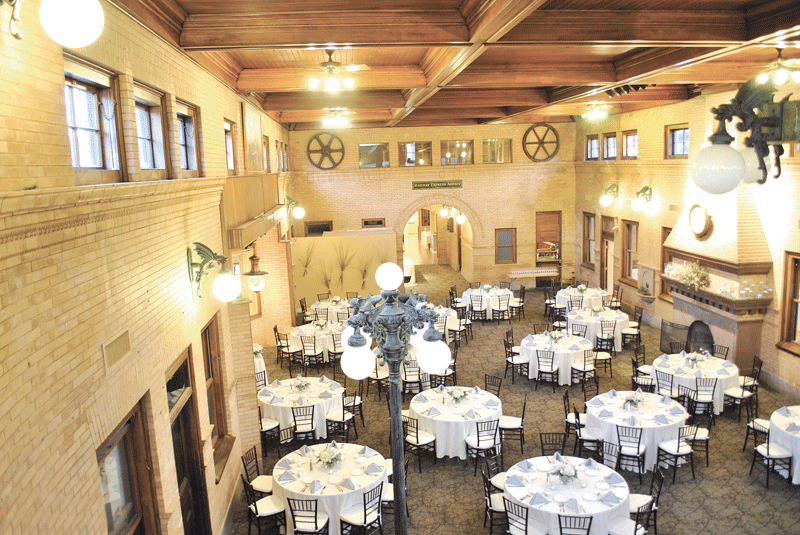 “There was no doubt in my mind that this area would become our banquet hall,” Micka said as he sat in the newly created, 2,800-square-foot Grand Ballroom, pointing out its lofty ceilings, striking archway, enormous fireplace, buff-colored brick walls, and impressive windows. After repurposing the Lounge and transforming the Italian eatery into a ballroom, Micka focused on the rear of the building, which became the Platform Sports Bar. 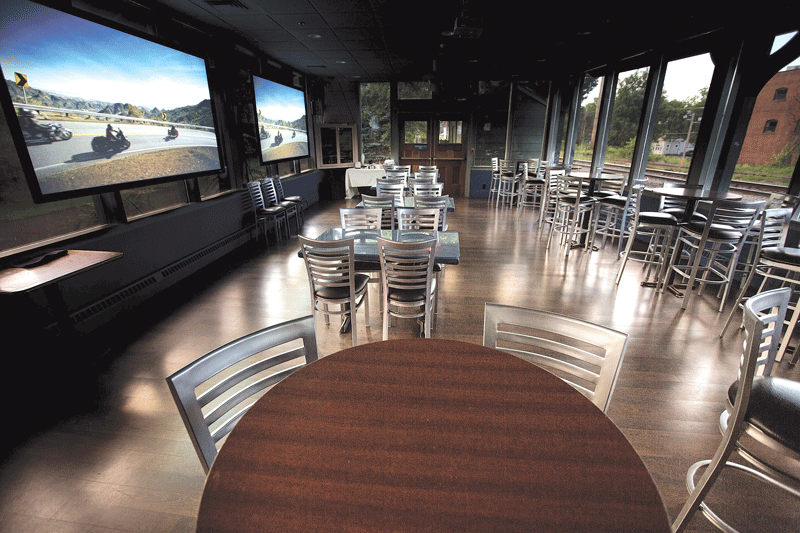 It boasts 21 televisions with surround sound, 110-inch projectors, and seating for almost 200 people. “During the winter, we have a disc jockey, and we have had wedding parties go into the bar and start dancing after the reception,” he said. People also frequent the well-known Tunnel Bar after events, and Micka has opened it early for group functions. Although the Grand Ballroom and Lounge are rife with character, they have a more formal feel, and since Micka knew some people prefer to hold events in a casual space, he built the Blue Goose Room in the rear of the sports bar, where small parties gather and enjoy pub-style food and cocktails. Since Union Station reopened 14 months ago, 20 weddings and more than 100 events have been held in the ballroom, and an equal number have been held in the Blue Goose Room. There have also been numerous parties in the Lounge, including holiday gatherings for small companies, rehearsal dinners, bridal and baby showers, and more. “When we say this place is unique, we really mean it. We are flexible and appeal to so many different people,” Micka said. 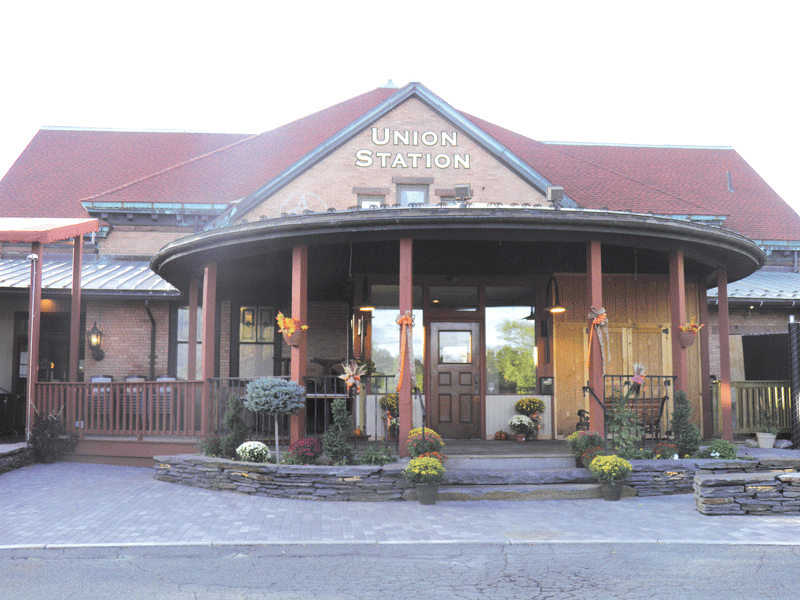 Union Station is a landmark in Northampton, and last December, Amtrak’s Vermonter began stopping at a new passenger rail platform located just to the south of the building. “The track runs past the station, and children who come to holiday events can be seen pressing their face to the windows when the train goes by,” Duncan said. The Lounge in Union Station can seat 50 people and is a popular spot for small company parties as well as showers, rehearsal dinners, and other gatherings. Micka added that the station is easily accessible. “People coming off of I-91 simply take a left, then a right a short distance down the road into our driveway. We own the parking lot and have 400 spaces. Food for all functions is prepared on site, and the chefs use as much local produce as possible. “I was born and raised on a fourth-generation, 60-acre farm in Northampton, so I know most of the farmers in the area,” Micka said. Duncan said the menu was designed to be upscale. But although many choices certainly fulfill that criteria, with entrees such as surf and turf and New York strip steak, people can also choose chicken wings, spring rolls, quesadillas, and other items typically served in the Blue Goose. Micka said people who enter the Grand Ballroom for the first time experience his initial reaction. Thanks to his vision, today people can make their own memories — and history — in a place deemed worthy of a visit by four American presidents.